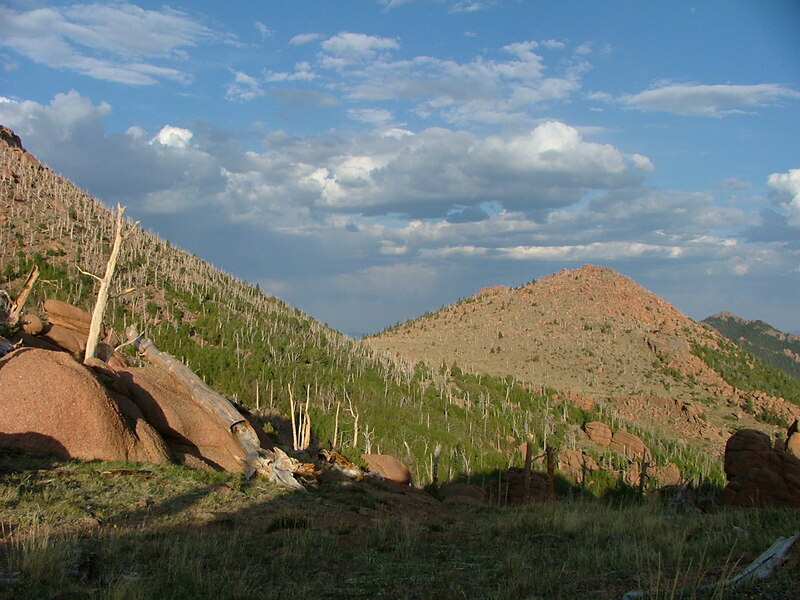 Lost Creek Wilderness derives its name from a creek of the same name. Lost Creek is something of a geologic anomaly. It repeatedly disappears into what look like dams made of old, rounded granite-like rock. I suppose in actuality it flows underneath these dams only to reappear a few hundred feet or a quarter mile downstream. The natural sculpturing in this area is amazing and another visit on my part would be well worth the time and effort. On this particular journey, I had slept overnight in McCurdy Park and woke to find the golden shafts of the morning sun illuminating the pink granite into a neon glow. Combined with the gorgeous weather of a June morning within a bucolic open meadow the feeling was one of enchantment and grace of being. I wandered around the meadow soaking up the now-ness of the moment as well as the morning’s dew on the grass. Soon enough camp was packed and we, that is the Original Pack and myself, trekked on down TR 628, the McCurdy Park Trail, via switchbacks into Lost Creek. The eroded granite began to take on some surreal qualities that left me in awe and wonderment. Huge boulders, rounded so as to eliminate any hard edges, gave the feeling of an architect gone made. The Creator certainly made this area a spectacle of mind and body. Despite all the greenery and groves of aspens’ whispering leaves, visibly and audibly earning their nickname “quakies”, this area is somewhat dry and the dogs were relieved to wade in and drink from Lost Creek while I gazed at the geologic marvels that abounded. From Lost Creek we continued to follow the trail which then ascended to junction with TR 612, the Goose Creek Trail. I’m not entirely sure but I do believe that Lost Creek and Goose Creek are one and the same. At some point Lost Creek ends its disappearing ways and turns into a normal creek, if you will. So this lower portion of the creek is named Goose, while the upper portion that performs its odd watery trick is known as Lost. Anyhow, that is how it seems to me when reading the topological maps. Regardless, at the junction I turned to the north and began to descend an unnamed gully that led to Wigwam Creek and the trail, TR 609, of the same name. Now, here is were I must confess to something that I would rather not. This gully was the sight of what some may construe as my most ignoble backcountry act. As I mentioned earlier, the area was fairly dry and standing water, while not scarce, was a couple or few miles apart from sources. It was a gorgeous “bluebird” day, scant clouds in the sky, the temperature nearly perfect. Perfect for me that is. For the canines, it was a trifle warm. So, naturally, they took every chance to immerse themselves when the opportunity arose. Well, except for Lucky Dog who wasn’t so fond of dunking herself and would only wade up to hear ankles. During this hike I had decided that it would be a great idea to keep the camera in one of the dog’s saddlebags so I could easily access it when I felt the urge to take a photo. Do you see where this is going? I stopped to take a quick photo and put the camera into Sheba’s saddlebag. Sheba, who, unlike Lucky Dog, loved to go for a swim at any given opportunity. I didn’t put the camera into Lucky Dog’s saddlebag, the same Lucky Dog who I knew wouldn’t instantly and without hesitation plunge into any large body of water. The trail and hike between the previous junction and Wigwam Creek was warm for me and most likely hot for the dogs. At least that was my assumption when Sheba spotted Wigwam Creek and made a beeline for the nearest deep pool of water. Since it was a slow creek and seemed safe enough with the flow being somewhat low I didn’t stop her. At the instant she dove in, water being sent up in a large wake, I recalled that I had place the camera in her saddlebag. Yes, the camera was ruined. So, no more pictures. And, I was out some hundreds of dollars. Well, at least I wasn’t lost, but I was kind of frustrated with myself. So, that is the reason there are only a handful of pictures from this day and none from the next day, the final part of the trek. I have some fleeting memories of the remainder of the hike, but I do clearly remember enjoying the natural beauty of the area. Wigwam Creek Trail passes through some great open meadow country, including East Lost Park. This is great mid-elevation country, full of aspen and conifers just underneath and south of the ridge that makes up the Kenosha Mountains. The more I think about this hike, the more I have specific memories; passing the Rolling Creek Trail Junction and noticing the typical Forest Service guide sign and how relatively untrammeled that path was; going over the shallow pass between Wigwam and Lost Creeks; East Lost Park and exploring a bit downstream along Lost Creek; camping for the night in a small tributary about a mile from the Lost Park Campground and finding frost in the morning. Aye, frost on a June morning at 9,800 feet. So, it couldn’t have been too late in the month. That morning, we had our breakfast and packed up. We continued to hike – past the Lost Park Campground which is located in a nice setting; up into Indian Creek and through a large meadow to a point where the trail began to climb up to Bison Pass. From the Lost Park Campground to Bison Pass, I was on TR 607, the Brookside-McCurdy Trail. Bison Pass is the location where I had first come up Ute Creek and its same named trail, TR 629. I vaguely remember being at the pass and thinking about how the loop had been completed and that two days ago I had passed this very location, only at that time I had a functioning camera. However, I was also a bit more contemplative and remember comparing states of mind between the inbound trek and the then current outbound portion. Two days’ difference in perspective made for an interesting comparison. The Ute Creek Trail returned me to my car located at the Ute Creek Trailhead. The hike down was fairly quick and warm, exposed on a southwest flank. The dogs were happy to soak in Tarryall Creek once we reached the trailhead and soon we were on our way. There was a small country store nearby and I was all to happy to make their service available to myself. I believe I had a Coke. On the return trip, I went north up to Jefferson and U.S. 285. On the inbound trip I had approached the trailhead from the south and U.S. 24. Gorgeous country all around, an area well worth spending some more time exploring and hiking. The Book Cliffs loom over the Grand Valley, rising nearly 2,000 feet above the Colorado River and its environs. I had decided to head up to Grand Junction so I could do some shopping that couldn’t effectively get done locally here in Gunnison. However, before commencing said shopping I went out to Palisade at the eastern end of the valley to access a trail that leads up to Mount Garfield. To get to the trail was an event in itself, passing through a claustrophobic underpass beneath Interstate 70. The Book Cliffs are composed of a thick layer of shale which is capped by a hard layer of sandstone. The shale is mostly decomposed and has eroded into peculiar fins and slopes. The trail crosses a flat for about a hundred yards before abruptly ascending one of the fins that have formed perpendicularly to the main slopes. The fin rose steeply, at points steeper than stairs, and dropped off sharply to either side at a slope of sixty to seventy degrees from the horizon. The trail was generally wide but at times I could easily spread out my arms knowing that my hands would be hanging above the drop-off. Unlikely it would be that I would fall, but that steep slope fell for hundreds of feet and taking a tumble would be fatal. Part of the complication for this hike is that the slope is on a southern aspect and can get quite warm even in the early part of spring. This is some dry land, water is sparse, so my thought was to beat the heat by arriving early. However, the previous night had brought down a cold chill throughout the Western Slope and even the clear sky with sun shining bright couldn’t bring warmth to this hike. Not only was the air temperature cold but there was in addition a cold wind blowing out from the canyon to the immediate east. Even exerting myself during the climb wasn’t warm enough and I felt exposed on that fin, with the wind whipping and the dogs running around on four-paw overdrive while my two-foot drive was challenged getting traction. I was relieved when after that first part of the climb the trail reached a level plateau that provided a respite from the wind and slopes. The trail then proceeds up a small cliff of sandstone that requires a bit of scrambling to ascend. A short distance later, the path led directly underneath the cap of sandstone which created another peril. The fractures in the rock and observations of large boulders below that had obviously tumbled down from this very formation gave the impression that the rock could collapse at any moment. Geologically this occurs rather frequently, but in the life of a human being it is relatively rare. Nonetheless, I was happy to traverse across this new exposure and make the final climb to the summit. Once on the summit, the wind did abate, but only slightly. We didn’t stay long, especially since Leah had a serious fascination with the top edge of the cliff. She desperately wanted to investigate the precipice but for fear that rock would crumble or she would plunge headlong after a chipmunk I would not let her. 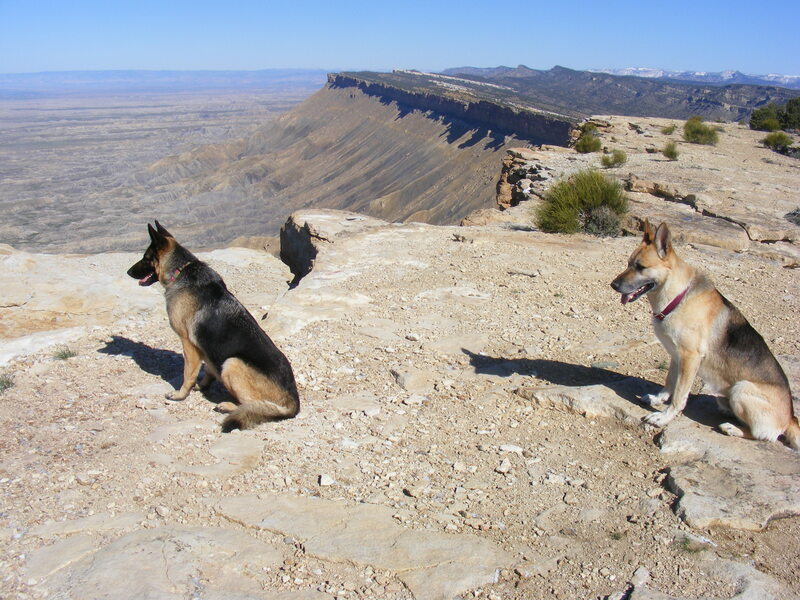 The view was stupendous, not only of the valley directly beneath and the cliffs on the far side of the valley but also the Grand Mesa and the various ranges and plateaus to the east. The high points to the east were covered in a fine layer of snow from the storm that had directly proceeded the cold front. This is one of my favorite types of views, with ridge after ridge fading farther and farther away until nothing but mystery remains. Unfortunately, the batteries in my camera had run low so I only made six photos, and they barely begin to reveal the stunning beauty of the area. I didn’t make shots of the fins or the trail beneath the rock cliff. I did take some shots of the mountains to the east, but the vastness that I felt while standing there in person didn’t make the transition to pixel. So, someday I will have to make the hike again with fresh batteries and perhaps on a day when the wind isn’t quite so cold. By the time I made the uneventful return to the trailhead, the day had warmed considerably so that descending the same fin climbed earlier in chill was then done in heat. There is also the ruins of an old coal mine here as well as the tram that ran from the mine to the tipple. This is exciting country to explore, but it is best if the hiker doesn’t suffer from vertigo! During the winter and spring months the road ends at Pitkin, a small mountain community east of Gunnison. In the past I have visited this area extensively to hike and ski, but this year I only have visited this one time late in the snow season. I brought my snowshoes with me so that I wouldn’t post hole and get stuck in the deep snow. Nonetheless, the snow pack has warmed up enough that even with snowshoes I was breaking through the crust which made the going difficult. At times, I would step down and hear an ominous “whumpf” and the snow would settle all around me like a ripple in a pond, only it was more disconcerting since I was on the surface. After this occurred a few times, I began to enjoy the sensation of seeing the ripple expand, like a shock wave. Naturally, on such a warm and beautiful day, the trusty shepherds were out exploring with me. We didn’t go very far nor see much wildlife but it was still a great day to go out and enjoy the pine forest and smell the scents and feel the sun’s warmth. Spring is rushing onward and the nascent signs of life renewed are everywhere! I don’t remember exactly but I believe that this hike would have been in mid or late June. All the deciduous vegetation had the relatively fresh green appearance yet there isn’t any snow, even on the shaded north face. 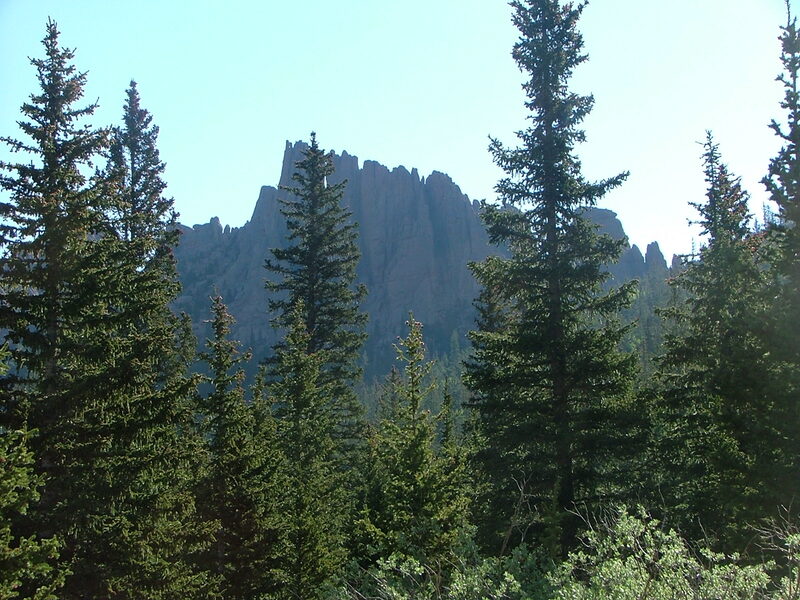 The Lost Creek Wilderness is comprised by the Platte River, Tarryall and Kenosha Mountains. All these mountain ranges drain into the South Platte River, one way or another, via Tarryall or Lost Creeks and other minor drainages. I started my hike at Tarryall Creek at the Ute Creek Trailhead. The Tarryall Mountains are essentially the ridge that divides Tarryall and Lost Creeks. Ute Creek Trail follows its namesake up to Bison Pass and the junction with the Brookside-McCurdy Trail, and is fairly steep the entire distance. It was also warm, exposed on a southwest facet. From Bison Pass I hike south along the Brookside-McCurdy Trail. The trail at this point follows the high ridge of the Tarryall Mountains and has great view of the surrounding countryside. The peaks are made up of weathered granite-like rock and are more reddish-brown than gray. The high ridge was also very grassy and felt like a comfortable place to rest so I remember taking my pack off and sitting among the rock for a nice break, meanwhile soaking in the view. The Brookside-McCurdy Trail meandered south along or close to the ridge line until it made a junction with the McCurdy Park Trail. Near this junction is McCurdy Park itself, a fine open meadow full of small wildflowers and tall grass, the whole surrounded by the eroded and rounded granite and tall conifers. I had brought the entire Original Pack with me, so at this juncture Lucky Dog, Lady Dog, Sheba and I made camp and settled in for a bit of local exploring to be followed by a peaceful evening enjoying the light from the setting sun. One sad note is that one of the photos I took of Sheba and Lucky Dog together at the trail junction between the Brookside-McCurdy and McCurdy Park Trails was the last of her that I ever took. Lucky Dog came down with cancer a couple of months hence and passed away the next April. She was a special girl in her own way, having led a challenging life on before she became my companion. She was perceptive and enjoyed finding unusual vistas to perch herself on. Anytime I was packing she would inevitably lay on top of the luggage as if reminding me not to forget the dog. A great friend and for her too-short life a great hiking companion. May I see you on the other side, Lucky Dog! The Round Hound! When living at the relatively low elevation of 7700 feet in the City of Gunnison, Colorado, it is easy to forget that the snow lingers up at the higher elevations. Especially when the slopes above treeline are also snow free. 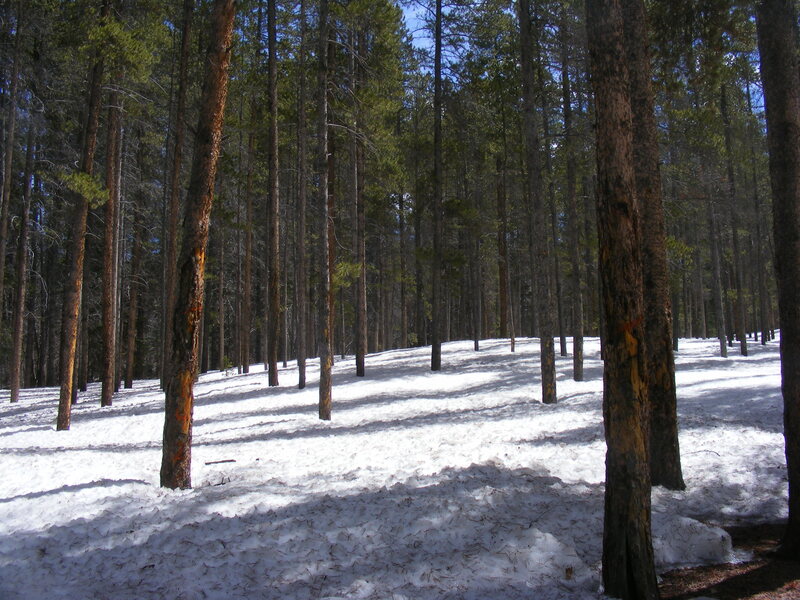 But in the high sub-alpine forests between 10 and 12 thousand feet the snow lingers in the shade of densely spaced conifers and doesn’t melt out until mid-June or even early July in a heavy snow year. The point is that in my early days of living in Gunnison, I repeatedly tried to hike to Lamphier Lake only to encounter deep snow about half a mile from the lake. This was one of those hikes. But instead of terminating my hike at the lake itself, I climbed up to Gunsight Pass above the lake and was able to look down into the upper end of South Lottis Creek. Gunsight Pass is well named, being a notch in the gray rock that allows passage between the two drainages. 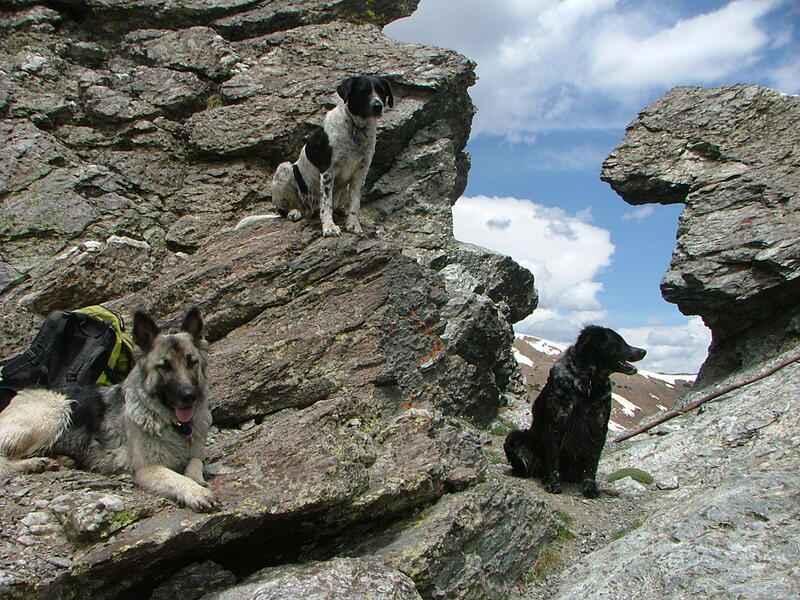 The photo of the three dogs, the Original Pack, on the rocks at the pass was staged by myself. It is also the photo that I use for my background on the computer, and perhaps my favorite of all the photos that I have taken. I only have vague memories of the hike, but I know that I started at the usual trailhead and hiked up the trail along Lamphier Creek to the lake and thence the pass. I also remember that the snow was deep and wet and I had to post hole through the drifts for a half a mile or so. The meadows were all soggy, and the vegetation at the high elevation hadn’t greened out yet. Mostly, it was a gray day, but there were also some early season flowers out and patches of blue sky. I took pictures of Old Man of the Mountain (Hymenoxis grandiflora) and some low growing Alpine Phlox (Phlox condensata), their colors standing out against the brown grass. Over the years, this hike to Lamphier Lake has become one of my classic hikes. From the trailhead on Gold Creek to the lake is just over two miles, but you gain just under two thousand feet in elevation during the trek. At the beginning there is a mixed aspen and conifer forest that slowly but inexorably changes to sub-alpine forest by the time you make the final climb to the lake. The trail crosses Lamphier Creek twice, and in general there is water flowing at the higher elevations from many small drainages. The lake sits just below treeline, and lies in a basin just below Fossil Ridge, which lends its name to the wilderness area that encompasses this area. A good place to spend the day, imbibing the thin air and good scenery. I slept well overnight, waking up early with the intent that I would pack up and begin hiking early so that I could avoid the intense afternoon sun. However, I found upon waking that the night time temperatures had plunged below the freezing mark and I was not in the mood to get up out of my warm tent and pack it all up. So I lingered. I was, however, happy that I carried the extra weight of my heavy sleeping bag all that distance. Before this hike I had thought about switching out my heavy but warm, more-apt-to-car-camping sleeping bag for the light weight but better for warmer weather sleeping bag. Regardless, the day dawned clear and blue, nary a cloud in the sky. In the end, I did get up early but instead of making a quick breakfast and moving on, I made a quick breakfast and then did a bit more exploring. 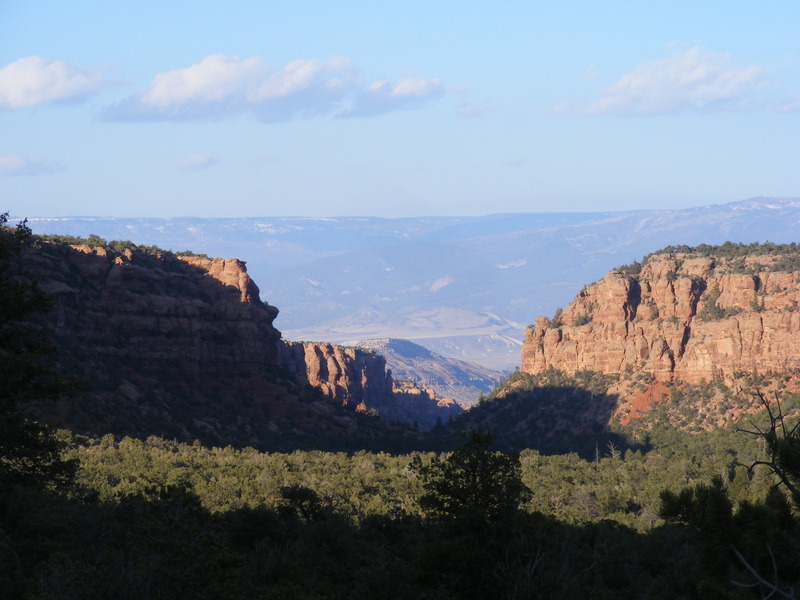 I didn’t go far from camp, just about a quarter mile or so to the top of a small slope of red earth, an eminence that gave me a good view of Big Dominguez Canyon and the side canyon that I made my camp in. The view of the main canyon was especially rewarding, as the yellowish and bright early light lit the verdant carpet of scrubby pinon and juniper, contrasted with the yellow and red canyon walls all of which meshed with the dazzling blue sky. The air was so clear this morning, crisp. The taller Douglas firs and ponderosa pines stood above the carpet and the individual trees caught the morning light in their needles and created auras in the branches. My little knoll caught the early sun and I was promptly warmed up all the while enjoying the scenery and feeling serene out here away from the daily grind. The sunlight hadn’t yet begun to shine on camp, but I was now sufficiently warm enough that I went ahead and packed up my gear and made ready for the day’s trek. It was cold enough that the live water had a skim of ice on its surface. My jug of water was ice free until I went to pour it while making breakfast and it immediately iced up. Typical for the area, I was chilly in the morning but now my concern was that the afternoon would be devilishly hot. The hike terminates along the railroad tracks and the sun shines brightly upon the cliff next to the tracks and reflects back onto the trail. I know from previous experience that the last mile of hiking can be arduous so I was ready to leave and beat the heat. I made my peace and said my good-byes to the surrounding area that had sheltered me for the night. This side canyon is a nice place to rest and recuperate and part of me didn’t want to leave. But the trail beckoned and I could do naught be heed the siren’s call. On the way up, I had the map in hand and knew my exact location at all times. On the way down I felt I was familiar enough with the major landmarks that I didn’t need to know my exact location. I wasn’t going to get lost, since the only way to go was either up or down and down was the order of the day. So down I went, towards the downstream strata that I knew marked my exit from the canyon. From many miles off, I could see Triangle Mesa, which overlooks the mouth of Big Dominguez Canyon. As I progressed the mesa became larger and larger and I knew that I was slowly approaching the end of the hike. Along the way, I enjoyed the changing geology along the trail. At times, the forces of erosion had removed enough overburden to expose the gray, hard rock that makes up the basement rock of the area. At other points, the trail winds through slopes of debris from the strata above. Some has been weathered into find grains while some times the trail wound through fields of large car and house sized chunks of sandstone that had previously tumbled down from the rim above. As the elevation decreased so did the amount of vegetation. The groves and individual trees more indicative of a wetter climate decreased until I was once again in the land of scrubby trees and overall sparse vegetation, reminding myself of the dryness of the land and how limited and precious water is in such a place. The dogs were especially happy to have the flowing creek into which they could plunge and cool off and refresh themselves with a drink. The hike was long, but for the most part uneventful beyond the usual appreciation for the land that I was passing through. At the old mine, more or less the halfway mark of the day’s hike, we stopped to take off the packs for a bit and wander around. I inspected the old hand winch and found a maker’s mark that indicated it had been manufactured in Seattle, Washington. I peered down into the old shaft of the mine, noting the rotted support timbers. It is good that the state has sealed off the access, for whatever went down that shaft would not be coming back up. The dogs romped around in the creek for a bit and I sat in some shade, admiring the natural surroundings. The sandstone in places has fallen in such a way as to create cavernous coves into the walls of the canyon. Almost like an arch is being created. I did see one natural arch, but it was created out of the eroded debris and seemed to me to be very unusual. It was across the canyon and far up the other side, so I didn’t go inspect it but was fascinated by its existence nonetheless. Hiking in the other direction I found another panel of petroglyphs that I hadn’t seen on my hike the previous day. To me, it was the best of them all and I was once again impressed with the effort that had gone into its creation. A very short distance below that there was a group of ladies making the hike to see the artwork. I had my pack of dogs and they had theirs – three large German shepherds. We were both impressed and appreciative of each other’s dogs. The petroglyphs are relatively close to the trailhead so I knew that the hike would be soon over. I savored the last hour of hiking, noting all the natural phenomena. The cottonwoods and other deciduous shrubs appeared to have even more leaves and green on them and I took special note of the contrasting colors as I passed by. The red earth gave a clue to what was here before. It is most difficult to see across such a long time, millions of years, to go back to before the current Rocky Mountains and imagine the ancestral Rockies, nothing of which remains except the red strata that is the eroded remains of those ancient peaks. We emerged from the canyon’s mouth and both dogs made way for the Gunnison River to plunge into its cool and murky depths. Two Canadian geese protested our presence but in the end just swam away slowly to the other bank. Upriver was a large wading bird, still as the rock, waiting for a morsel to appear, perhaps. The air was warm, the river cool and I was hesitant to finish up the hike as I would prefer to stay among the cool trees. But, alas, the decision was finally made to continue onward over the bridge and along the railroad tracks, through the heat and over the challenging rock that makes up the ballast for the railroad grade. It was a relief in the end to finally make it back to the Bridgeport Trailhead and undo the packs. Before we drove off back to civilization and modern responsibilities the dogs and I made one last foray to the river; a quick dip for the dogs and a last moment of contemplation for me. We were all fairly tired, but the drive home went quickly and uneventfully and the dogs were so tired that Draco didn’t even hang his head out the window as he usually does. But, dang, what a great hike! This paintbrush (Castilleja spp., a member of the Snapdragon, or Scrophulariaceae, Family) has found a niche. Four weeks previous I had visited Little Dominguez Canyon on my inaugural backpacking adventure of 2014. Early on the seventh of April, while most of the local population was sleeping or preparing for the workday ahead, I arose well before dawn and made the final arrangements before heading down the road towards my next voyage. The prior evening, I had loaded and checked my backpack so all I had to do this morning was load it into the car. I fed myself, inundated my belly with a quart of coffee and then loaded myself and the two faithful shepherds and drove off. Lady Dog remained at home, having only three legs not truly able to hike any more than about a quarter of a mile at a stretch. To compensate, I made sure she had a good, fresh bone to gnaw upon. I knew that later that evening the dog-sitter would arrive to provide good care. I reached the trailhead just after first light knowing that we had a nearly twelve mile hike ahead of us. By arriving early, we were able to get a good start on the day. This trailhead I have used extensively over the years so I am familiar with most of the sights along the way. Half a mile along the railroad tracks, pressed up against the cliff before crossing the tracks and making another half a mile before reaching the combined pedestrian and equestrian bridge that crosses the Gunnison River which in its lower reaches has a width nearly the length of a football field. Then another half a mile along the river until the mouth of Dominguez Canyon is reached. From the mouth it is roughly three quarters of a mile to the confluence of the Little and Big Dominguez Creeks. Up to this point, the hike was similar to that which I had done previously, but now it became a new adventure, trekking on a trail that I hadn’t used for many years, perhaps as many as five. The other obvious difference between this hike and the previous was that the flora had a few more weeks to green up and the cottonwoods in the lower stretch had leaves that suggested having just budded out. Spring time produces that bright, vivid green that dulls out a bit as the season progresses. But for the moment, it was all fresh, and in the morning’s early slanted, yellowish light the vibrant verdant combined with the Mars like red sandstone to produce a feast for the eyes. The air was clear and nearly scent free, fresh and crisp every breath filling the lungs with wholesomeness. A short distance up the canyon the observant will notice a large panel of petroglyphs. The varnish commonly found on the sandstone was diligently chipped away at producing numerous representations of importance to the ancient artist(s). Certain unscrupulous people have attempted to enhance their own meaninglessness by adding their name and date, one of which was nearly eighty years old if the date is to be believed. Although defacing and distracting from the true art, their attempt at infamy is minuscule and hasty. Probably using a rusty nail to do their nefarious inscribing, said individuals were barely able to scratch a mark in the resistant varnish. What amazes me, therefore, is just how much effort and time the original artists put into their creations. To chip out a furrow an eighth to quarter inch deep must have taken a considerable effort. I continued my journey up canyon, the red rock combining with the blue sky and green vegetation to create a full spectrum of color and awe. There are a few side canyons that invite exploration, especially the Dry Fork of the Dominguez, but although tempted, I also knew that finding a path through the tumbled-down rock and scrub brush would be a time consuming endeavor so I kept on the trail leading up the main canyon. Before long, I came upon the ruins of an abandoned mine site. There was an old rail cart, a hand-powered winch with a stated five ton capacity and over the vertical shaft the state of Colorado had covered with a thick metal grate. The quartz intrusion in the bedrock was probably what the miners were interested in, but I don’t know what the metal of interest was. Shortly thereafter we came upon the junction of the Cactus Park Trail, the only way to enter or exit the canyon except for the mouth and exit many miles up. We rested a bit, and then climbed up to the canyon rim to get a view of what lay behind and what awaited us. The trail climbed a ridge of eroded rock and went directly under a precariously perched boulder held aloft by a pedestal of crumbly conglomerate composed of mud and small rock. This boulder seemed to defy gravity and all senses suggested that it should tumble down at any instant. Yet, there it stood, directly over the trail. I’m not sure who put the trail under this rock, but they have a great sense of humor. I didn’t linger long and made my way quickly by the rock before scrambling up the remainder of the geologic layers to a point were I could look back down into the canyon. Upstream didn’t allude to what lay ahead, but looking back downstream I was impressed by how sharp the canyon walls were. The difference between looking down into the canyon and looking up out of the canyon may be just perspective, but the two are completely different experiences. The former gives the impression of the gorge cut into the earth, a barrier that impedes travel if attempting to get from one rim to the other. The latter produces a sense of isolation, that all that exists in the world is what can be perceived up stream and down. Despite the desert location and general desert feel to this hike, Big Dominguez Creek is perennial and the dogs were able to access water fairly frequently. Although at times the trail climbed high upon the eroded debris to avoid the tangle of boulders that choke the main stream. A mile or so above the Cactus Park Trail, the Big Dominguez Trail begins to fade and at times is difficult to follow. More so on this occasion because I was thoughtlessly following Draco the Shepherd who had the tendency to wander off on side trails following whatever his nose dictated to him was more interesting than the main trail. More than once I found myself having to do a bit of searching to find the proper route through a side gully or around other obstacles. This could have been alleviated had I paid a bit more attention to Leah the Shepherd who is diligent about following the main trail I find it interesting that the two canines have such opposite views on travel. The upper portion of trail does more climbing than the lower and must also skirt large outcroppings of basement rock and the gullies created by the occasional waters of the side canyons that occur every quarter mile or so. Over the course of the roughly twelve miles that we covered, we climbed about two thousand feet in elevation. The change in vegetation is slow and subtle. 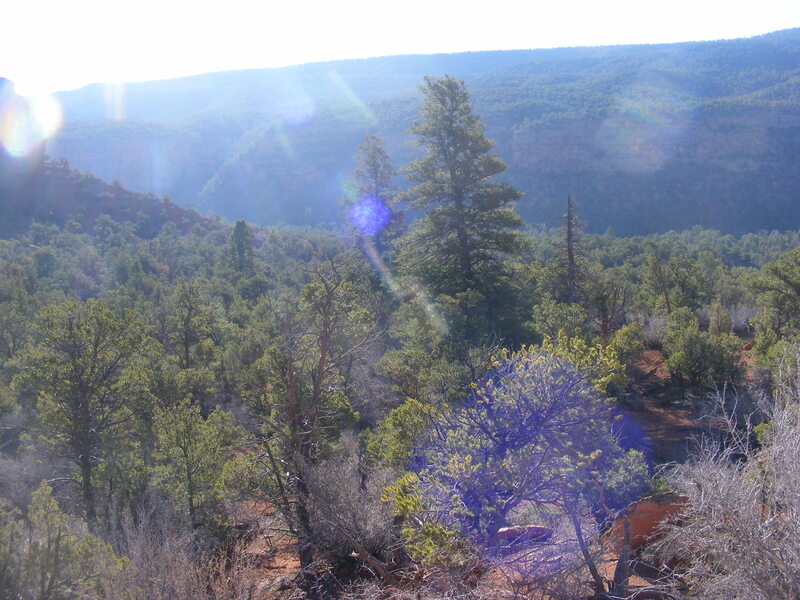 There is located near the confluence of the Dry Fork one lone ponderosa pine at an elevation of 5200 feet. What an astounding specimen to have survived in that location, because the next ponderosa isn’t located until about a thousand feet higher in elevation. I love the transition between desert and montaine. At one point I looked up on the canyon walls and there were groves of Douglas fir. Large ponderosa pine grew down by the creek and the pinon pine kept getting larger. I think of the pinon as being scrubby but some of the trees grew with a single large trunk and to a height of fifty feet or more. This was another topographic exercise for me, and once above the old mine and the Cactus Park Trail, I kept the map in hand and charted my progress. Finally, in the early afternoon we reached our destination, a side canyon a couple of miles below the campground that the Bureau of Land Management maintains. We found a good location fairly free from the cactus commonly found intermingled with the grass. I have camped here at least once before some many years ago. This area is extremely quiet at this time of year, and once I unloaded my pack I took time to enjoy the quiet and contemplate all the heavy questions that plague most people. But not for long, as camp needed setting up and after all that heavy hauling I was ready to explore the immediate area sans weight on my back. The side canyon splits into two a scant half mile or so up from the Big Dominguez. Years ago, I remember having explored the left fork of the canyon. So this time around I decided to explore the right hand fork. What also drew me to this fork was the large ponderosa pines that towered over the pinon and juniper. I love ponderosa pines and the parks that a mature stand will produce. In the lower reaches of the right fork canyon there was a small park of three large ponderosa. I bushwhacked up another quarter mile and was rewarded with the presence of a jumbo sized ponderosa (well, jumbo sized for this area) that had been scratched up by a large carnivorous beast of some sort. Possibly this tree was a large scratching post for a mountain lion, but it could have also been a black bear. The trunk of this particular tree was about a yard diameter, and I am not embarrased to have given the beast a good hug. Besides, by getting close up to the tree I could imbibe the butterscotch-like scent that the sap is well know for. What a nice place. Because the day was still young, we returned from the right fork canyon long before nightfall. So, the dogs and I continued up the trail towards the campground until we reached a high point that allowed a view down the canyon. I found a red knoll to perch myself upon and gaze at the canyon up and down. So green the carpet of trees. So red the eroded earth. Blue sky in a dome above. A riot of color to be sure, but as a reminder of the elevation and early season, there wasn’t a flower to be found and the deciduous trees and shrubs had yet to bud out their leaves. We returned to camp, made a supper and then sat in contemplation as the sun set slowly and the blue sky turned pink, purple and red. Soon the stars began to come out and while the dogs curled up into furry balls of warmth, I slipped into my sleeping bag and drifted off into the subconscious without worries eagerly anticipating the next day’s sun and return hike.